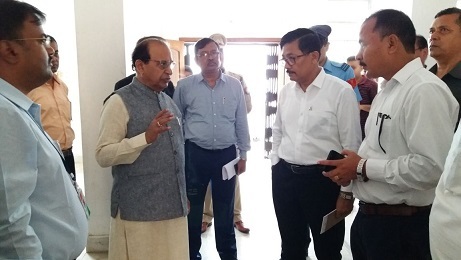 Assam Governor Prof Jagdish Mukhi on Thursday visited Chirang district and held a meeting with the security agencies and the district administration to take stock of the present law and order situation in the district at the conference hall of the Deputy Commissioner’s office. 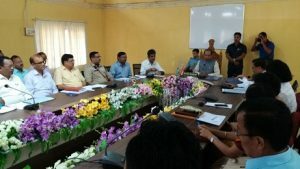 On his arrival at the district headquarters, the Governor was accorded traditional reception led by Bodoland Territorial Council (BTC) principal secretary Biren Chandra Phukan. He also had a meeting with the district heads of all the departments to review the State and Central government schemes including Swachh Bharat Abhiyan being implemented in the district. During the meeting, the Governor said that whatever amount of fund is received for developmental activities, it must be utilized with transparency and accountability. He called upon the officials to implement every scheme intelligently with personal involvement. Prof Mukhi said that the officials must reach out to the public and facilitate them in availing government schemes. He asked Agriculture, Krishi Vigyan Kendra, Irrigation, Fishery, Soil Conservation and Veterinary departments to jointly work out to increase agriculture production to ensure double income of the farmers. The Governor also stressed on speedy and properly implementation of the centrally-sponsored schemes like Ujjala Yojana, Swachh Bharat Abhiyan, Mudra Yojana, etc. Continuing his practice to visiting government offices, health care facilities and educational institutions for having first-hand knowledge of the basic amenities in the district, the Governor visited the District Centre, JSB Civil Hospital and BGR HS School, Dhaligaon. Interacting with the students, he asked them to focus on study with interest in extra-curricular activities. Later, he gave a patient hearing about the problems and grievances of various political and non-political organisations like BPF, Shiv Sena, BJP, UPP(L), ABSU, BSU, AKRSU, ABMSU, AAMSU, AABYSF, AASA, ASSU and assured of addressing their problems. The Governor also had a discussion with the media.